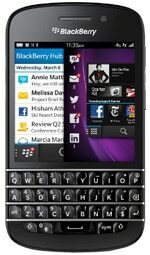 The BlackBerry Q10 is a keyboard-equipped variant of the BlackBerry Z10. Both handsets were announced on 30 January 2013, with the touchscreen Z10 becoming available the next day. The Q10 started shipping in May 2013.